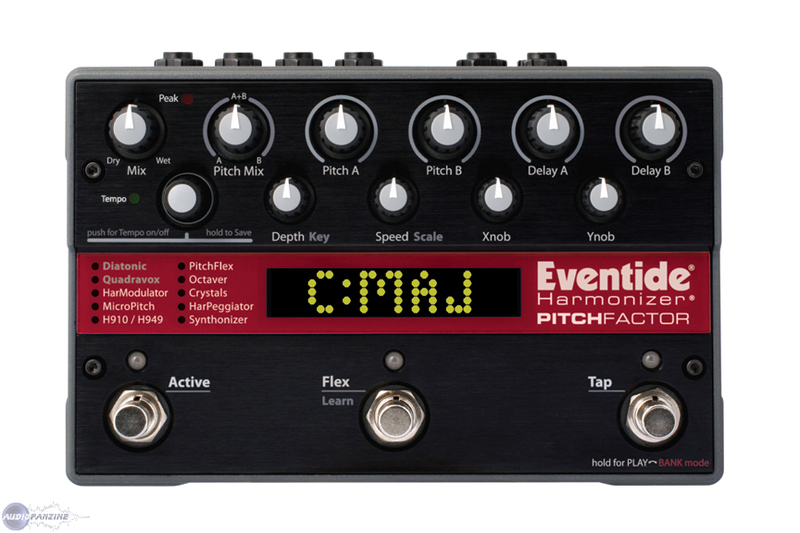 The Eventide Pitchfactor is a digital harmonizer, and also dabbles in delay, echo, chorus, flange and a bunch of other things including a synth and fuzz patch there are a bunch of hook ups including midi, usb and multiple in's and outs for wet dry setup or whatever you please! The manual is a little hard to understand, but it gets you where you need to go, it definitely takes time and effort to learn how to use it effectively. There is so much to do and learn that it take months to really understand it in my opinion. It's simple enough to get used to, but after that it just gets deeper, its crazy how much is in it! I use it with my guitar obviously, and also plugged it into piano and bass before. I've said pretty much everything I wanted to, it sounds amazing, its a little expensive, and the learning curve is a little sharp at times, but once you get it, its unbeatable as a harmonizer! I highly recommend it! This is one of eventide's digital stomp boxes packed with ten of their signature pitch shifting effects such as : Diatonic, Pitchflex, Quadravox, Octaver, HarModulator, Crystals, MicroPitch, HarPeggiator, H910/H949, and Synthonizer. It also has some delay and a built in tuner!! It's also upgradable via USB, has midi in and out, you can also plug an expression pedal into it. This is sort of almost an all-in-one pedal version of eventide's rack effects. I might be missing a few things when I review this, simply because this pedal is very very complex and it is so hard to go into complete detail about this and also very hard to simplify it to just a few words. So i'll try to shoot for something in between-ish..
Ok for utliziation, basically just imagine that you can pretty much tweak every single parameter of the pitch effect, everything. You can even add delay to it for different effects and once you add the expression pedal, you've got it ALL. I strongly encourage one to look through the manual to figure out how to tweak and set the right options on the pedal. The tuner thing, I had no idea how to do that for a little while until I saw it in a youtube demo and finally figured it out from that. There are a lot of neat things one can do with the pitchfactor and it all depends on what you want to do with it. Though it is rather difficult and has quite a bit of a learning curve, thus the lower score. It's not exactly plug and play. The sound quality is great. It's all digital of course yet the signal is clear and very high quality as eventide is known to be. Because of this it works great on guitar, bass or whatever you wanna plug this baby into! Be prepared to hear some really really cool sounds! The pitches are great, the tracking is top notch. Just like eventide stuff is known for, there is nothing lacking in the sound department, that's for sure. Crystals is my most favorite setting ever. I wish eventide would just release a single pedal for the crystals option, I would buy that in a heartbeat. It's so unique and so surreal sounding! One thing to note about a type of pedal like this is that it's not about 'tone'. It's not about anything vintage or boutique etc. It's purely about the effect and how good it sounds. Eventide has never been trying to emulate or go after the vintage/boutique market so don't expect to hear any type of tones related to such. Overall this is great! It's jampacked and has everything. It's a high quality built pedal! And it's 10 of eventide's signature pitch effects in a pedal, with as many parameters as the racks have. There are some potential things I worry about; one being how to use this pedal live? It's sort of difficult to get around using live since there are so many parameters, it's definitely the type of pedal that needs to be tweaked before live use. Also switching certain effects on and off seems slightly tedious when I tried, however one of my buddies is using the timefactor live and seems to have no trouble getting what he wants when playing live. My other concern is the awkward power supply. It just sort of stands out, there's no substitute for it and so you'll have to use the one provided. That means it takes up more space on your board and you can't connect it to any of the pedal bricks that most players own. So it seems that though this is a pedal it's still sort of a 'studio' pedal as one would seem. It does look sturdy, the screen is big and bright, though it does worry me in live situations how it'll hold up to massive stomping and kicking etc. Again though my friend has had no problems thus far. Eventide has decided to dabble into the stomp box market finally, and this is one of the four pedals they came out with. It contains all of their extremely famous pitch algorithms in here, contains delay, has a synthesizer. crystals, octaver, etc. It's fully MIDI, updatable by USB 2.0, true bypass, can work in guitar or line level applications and can work in either mono or stereo. Eventide did an excellent job in building this wonderful pedal. The best thing is that this pedal is fully MIDI. You can have tons of presets set up and switch them all with a MIDI board. That means no fumbling around on the ground all the time every time you want to switch to different presets that are a few banks away. It's extremely sturdy and built like a tank. You could hurl this thing off the top floor of a building, and it should still work. The switches are extremely high quality, and it's true bypass so there will be no direct harm to your tone. The menus themselves are a lot easier to use than the rack stuff, I've found. There are tons and tons of features in here, so it's hard to exactly explain every little detail, so it's best to read the manual. The Eventide manuals are fairly long and a bit boring, but if you take the time to sit down with them, you'll know the thing in and out. The thing is AMAZING in terms of sound. All those famous sounds you've heard from Eventide are all housed in this little thing. I can't believe how good this sounds. The harmonizer really doesn't even need to be mentioned because it's so famous. It's lush and rich, and even the Axe-Fx can't come close to replicating this tone. The delays are also a wonderful added feature. If you're into making movie soundtracks, you can mess around with the crystals feature. It's crazy how versatile this pedal is. 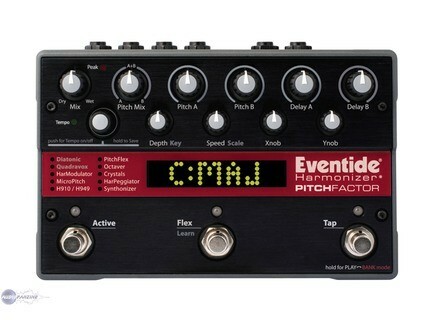 If you only have the money to buy one Eventide pedal, I recommend purchasing this one. It's built like a tank, has all the famous Eventide sounds built into it, can easily go effects like pitch detune and whammy, has true bypass, sounds amazing and is super versatile. Girou's review (This content has been automatically translated from French)" Musicality ensured"
why we bought it, right? a knob is understood immediately what it is. Roudoud's review (This content has been automatically translated from French)" saxophonist's best friend!" Many effects available, as explained below. These are mainly variations or mixture of delay and pitch shifter. We have included two Harmonizers 2 and 4 voices (with delay), a synthesizer, an octave, a pitch shifter, an arpeggiator, very particular effect crytalizer and other strange effects. The issue boils down to the pc app to manage banks. No rack. Digital technology but super quality. The configuration is simple, for each effect all parameters are front and graphic display reacts differently depending on the knob hit. The English manual is complete. Designers have thought a lot of practical tips for the musician such as tuner, adjusting the output level of the config switches, etc. .. The pedal is sufficient to itself, but it is worth joining a switch there to enjoy everything. The effects are great. Usually for a saxophone palette effective effects is limited, many guitar effects do not work (questions frequency waveform, I do not know ...). Effects that work best are the delay, reverb and pitch shifter, and that's good because it brings the pedal and super quality! - The synthetic harmonizer is fast, do not expect to replace the presence of another copper it will not work. It can however be used to delay 4 voices and there is fine. Note that unlike many types TC Helicon pedal, the delay is adjustable from 0ms real (no delay) to several seconds. - Flex pitch is great, very clean. Flex button to play on the pitch a bit like a wheel on a synthesizer, and an expression pedal makes it a whammy. - The synthesizer is not very effective, in fact it is very much a matter of level, it is very difficult to play louder than the sound of natural sax. - The Crystallizer is impressive. If you want an overview try the VST, the PitchFactor is a hardware version of the eponymous effect SoundToys. In contrast to compare the quality is better VST sound and max length of delay. This is normal nowadays given the quality of vst, but PitchFactor version is still really good. - The octave has a worse than the flex pitch, there adds a filter and a fuzz algorithm. It can be done if you push the resonance, usually once it's on two pinball sound engineer when he discovers. I would do this choice, the more we find Cygnus 300 euros now, which is really accessible for pro effects pedal. but basically diatonic and quadravox offer which may delay hamonizés choose the most behind in terms of milliseconds, but also rhythmic placement, with the kind quadravox making a note can have an arpeggio (major minor, etc.) and decide to open rhythmic paterns is unbelievable. Octave is very pro and sometimes electro rock sounds. Crystals and a pitch delay in the reverse with adjustable reverb, you can make real music with zombies so the expression pedal (to be added of course) can do the twirl in its very retanchements sometimes noise. Micro pitch, probably the best chorus you've heard mostly to sitcoms on generics. Harpeggiator is calibrated, it can decide to apply to different rhythmic patterns gaughe and right to make random choices and even their chatter fuzz (a bit too digital for my taste). Synthonizer is insane, trumpet, theremin and synthesizer we are! without laughing it works great. pitchflex, killing best pitch shifter (all levels) I've tried, and contrary to some opinions, I think the tears whammy of its kind. Well it's hard to describe all this as the parameters are broad. So it is connectable to a PC but I still failed, waiting for a response from eventide. Stereo input and output, USB port, midi in and out, entered the switch and expression pedal. The configuration is not very easy to start but we made it. Eventide had the sense to edit a quick start sheet that can serve as stupid if they think the treasure up. Indeed, each volume pot has a different destination by each impact, it is painful sometimes. The manual is very clear but in English. Editing is not always a breeze, you have to like hack (even if one happens to do exactly what you want in the end). Set a pitch shifter whammy u, very simple but we want to dice tamper deep it takes a bit more concentration. I soon find myself in the cheesy stupid as in the frenzied experimentation with one click. I use the beast with an electric guitar, but it works on everything. The other day I put it on a drum, what did I laugh! There are no effects that I hate in this pedal, everything seems workable but it takes time. I use it for 4 months and I'm only 10% of opportunities. In addition eventide just do an update (another advantage of the USB port and south) with new methods for quadravox and lots of improvements here and there. I tried many harmonizer and pitch forward, PS2, PS5, hr2, RP300, whammy, etc. and I never came across as complete a pedal for a reasonable price in my opinion. It's been awhile since I watched eventide but I've never had 5000 euros has snapped like that for an H foo. The I'm thrilled because it really helps me cope and it makes me grow in harmony because i like the way quadravox so that if I make a note in the mode or not so well it does not look like anything! I refer this chosen without hesitation.